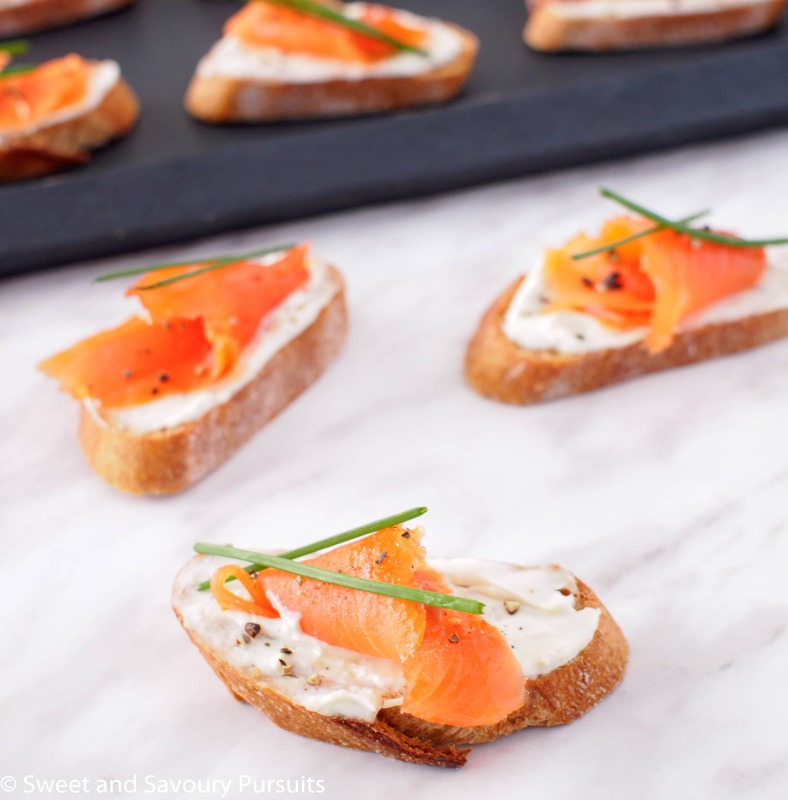 This Smoked Salmon and Boursin Crostini has only a few ingredients, can be assembled in minutes and is sure to impress your guests. Appetizers made with smoked salmon have always been a favourite with my family and friends and so today I’m sharing this amazingly delicious yet so easy and quick to make Smoked Salmon and Boursin Crostini. Most of us live very busy lives and sometimes this can leave us with very little time to prepare for dinner parties. 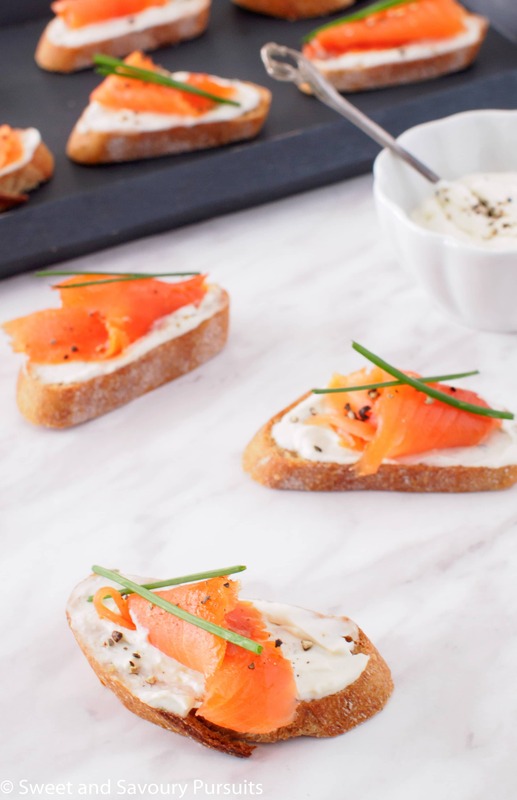 If you are left scrambling trying to figure out something special to serve that won’t take you all day to prepare then consider this delicious Smoked Salmon and Boursin Crostini. This appetizer is made with 5 ingredients, well, ok 6 if you consider olive oil on the crostini an ingredient! This Smoked Salmon and Boursin Crostini can be ready in minutes and looks beautiful once assembled. You can toast your slices of baguette ahead of time and let them cool until you are just about ready to party! To prepare this appetizer, begin by combining the Boursin cheese with sour cream and whisk it vigorously to form this velvety smooth cream that can be easily spread on the toasted bread. Spread the mixture on the crostini and then lay a slice of smoked salmon on top. If desired, sprinkle with a tiny amount of freshly ground smoked pepper (regular pepper) and top with a spear or two of fresh chives. Et voilà, you’re done! I assure you every bite of this appetizer is scrumptious! Place a rack 6 inches from the broiler element and heat the broiler on high. Set the slices of baguette on a baking sheet. Brush the tops with a little olive oil. Place the baking sheet under the broiler and toast the bread until they are crispy and lightly golden on top, about 2 minutes. Whisk the Boursin cheese with the sour cream until you have a lump free creamy consistency. Take the crostini and spread the creamy cheese on top. 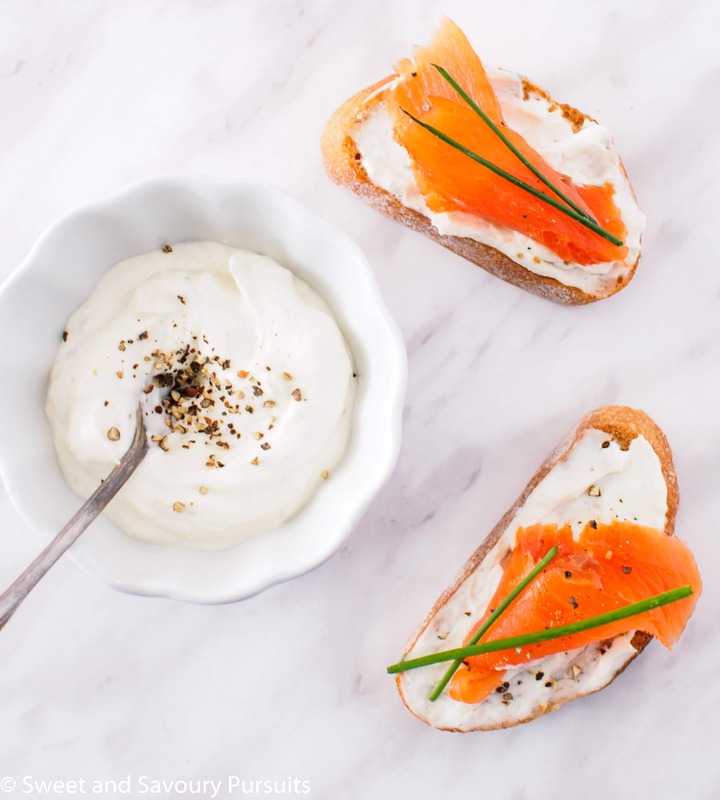 Place the smoked salmon over the cheese spread and sprinkle with a tiny bit of smoked pepper (if you have it). To finish, garnish with fresh chives. Why would these have to be “served immediately”? I was hoping to make them to take to a “pot luck” holiday gathering which is about 30 minutes from my home. Hi Joan, you could do that for sure, but the humidity from the cheese and sour cream spread will soften the bread a little and so the crostini won’t be as crisp. Also I’m not sure how well the assembled crostinis will travel, they may come apart a bit. Is it an option to assemble the crostini at the gathering? My pleasure Joan. If you really want to make something with smoked salmon, you could try the smoked salmon and cream cheese dip on my blog, it’s delicious, can be served with a variety of veggies, crackers and breads and it will travel very well. Thanks! Appetizers with smoked salmon are always a hit with me! this is so fancy looking! i adore smoked salmon, though i never buy it. for a nondairy version, when i need a bagel lox, i typically ask for avocado and it provides just the right amount of creaminess. but using garlic&herb cheese is so goooood. I agree avocado is really good as well. It’s a great idea for a creamy base substitute for those who don’t each cheese or simply for variety. Thanks for the idea! Thank you Indu! Boursin is really delicious and it comes in different flavour variations as well. But I’m sure that flavoured cream cheese would also be delicious. Yum, I love smoked salmon paired with cream cheese. Never tried the Boursin herb flavour, but I’m sure it tasted as amazing as it looks. Now I have to go find me some of that cheese! Thanks Janine! Hope you can find it but if not I’m sure a garlic and herb cream cheese would be delicious as well. I’m glad you were able to join us for this special occasion despite your busy schedule. 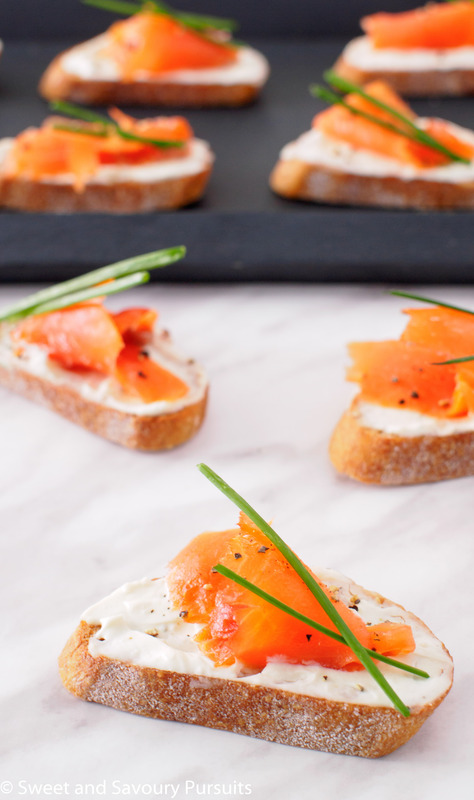 These crostini are so pretty, and a delicious way to enjoy smoked salmon. Beautiful photography too. Hope you enjoy the party which is still in full swing. Thank you so much Hilda. I hope to return to FF52 tonight to see what more others have brought with them :). We’ve been on a Boursin kick lately in our house. My kids just slather it on plain crackers. Quick snack after school. Putting it on crostini and adding smoked salmon turns it into an appetizer fit for a special occasion! Boursin is definitely a favourite in our household as well. It pairs well with so many foods. I’m glad that this appetizer turned out to be special enough for FF52! This appetizer is a show stopper! I really like the combination of using the boursin instead of just a creamed cheese. Thanks Julie! I liked it too, the flavour of this Boursin cheese really goes well with the smoked salmon.